Even though there isn’t much you can do about the weather whenever you’re out camping, it certainly couldn’t hurt to pack the tools to make your life easier. People are nowadays beginning to take not only the essentials with them but a few rather interesting devices as well. Among them, camping fans are seeing a rise in popularity and understandably so considering how practical and maneuverable most of them are. That said, let us point out that not all camping fans are built to the same standards, which is why you need to learn as much as possible about them before you commit to a purchase. To help you through, we put together a list of the ten best camping fans money can buy. The Skyri Ceiling Portable USB Fan is an energy saving gadget designed for outdoor use, especially camping. Ideal for a hot day outdoors, it features socket-like blades that do not require any screws for installation. Backed up by a 12V DC charger, it features two additional power interfaces including batteries and solar energy. Made from durable high-quality material, this portable fan offers optimum airflow and helps in preventing mosquitoes and insects from disturbing you while you sleep. Designed for personal space cooling, the Mini 6-inch Quiet Small Personal USB Fan is ideal for home, office and outdoor use, including traveling, fishing, camping, backing, or picnicking at the park. 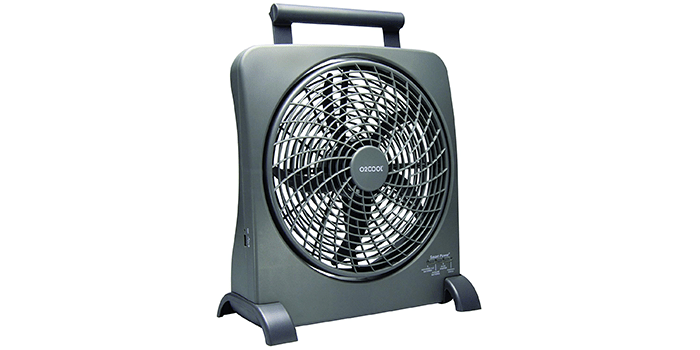 Featuring an adjustable head, it allows users to tilt the fan and focus the direction of the airflow wherever needed. 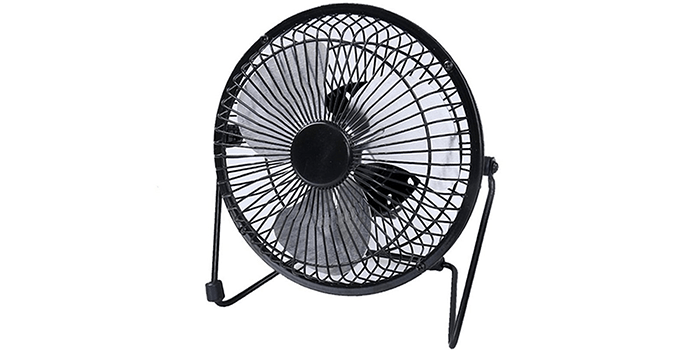 Featuring heavy duty 6-inch blades, it offers an optimum airflow and is relatively noise-free. 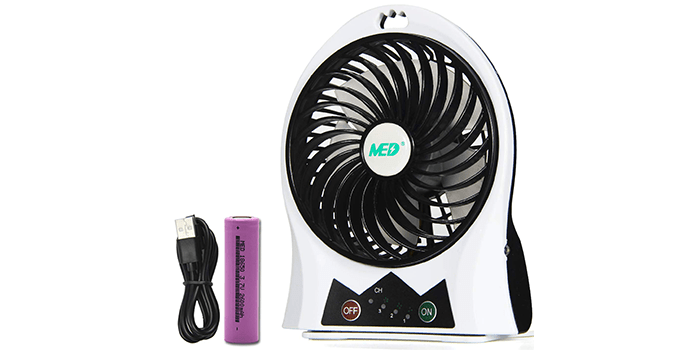 Equipped with 3 adjustable speed settings, the MED Rechargeable Portable Handheld Mini USB fan allows you to choose the appropriate wind control depending upon the temperature and environment around you. 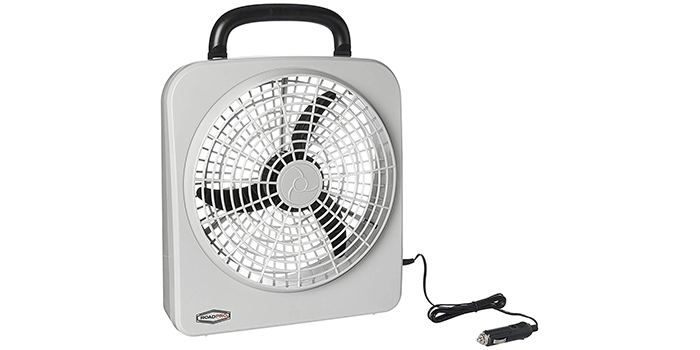 Easy to set up and operate, this fan can be plugged into your smartphone charger or into your PC USB interface. Ideal for home and office use, this fan can also be utilized outdoors, while traveling, camping, hiking and more. 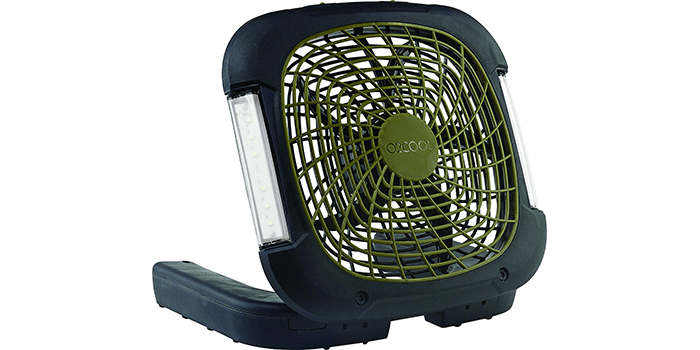 Along with the fan, it also features a handy emergency side light that comes in use during emergencies, power outages, or at night while camping. 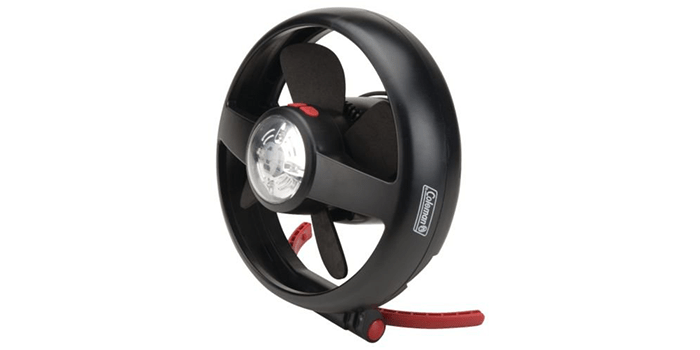 Ideal for outdoor use, especially while hiking, camping or any similar kind of outdoor activities, the RoadPro RP8000 10″ Indoor/Outdoor Dual Power Fan is quick and easy to set up and use. Thanks to its versatile design and construction, it can also be utilized in RV’s and trucks and helps to keep you comfortable in the hottest temperature. Constructed with high-quality materials, it features a slip-proof handle on the top that makes it easy to carry around. Compact in size, light in weight and durable, it comes with powerful 9 blades and 2-speed settings. The BicycleStore 3-in-1 Multi-function Portable Mini Fan is a premium grade gadget that comes with multiple power sources including a solar power battery charger and a main input charger. 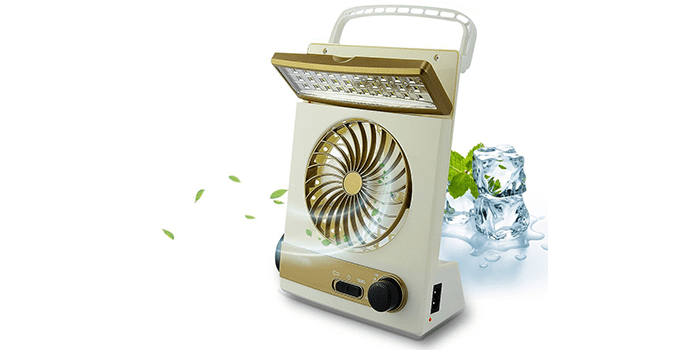 Unlike other gadgets of its kind, this one can be used as a fan as well as an LED table lamp or spotlight torch. Featuring a quiet motor, it is noise-free and extremely easy to operate. Crafted with a plated cover, users can adjust the angle of the wind according to their needs. Ideal for camping, emergencies, transportation, or whenever there is a power outage, this lamp is convenient, portable, and surprisingly light in weight. Known for its durability and high performance, the O2COOL Portable Camping Fan with Lights, is the ideal battery-powered gadget for all outdoor activities. Featuring 2 settings for adjusting the fan speed, it comes with heavy duty LED lights with 3 different modes. Unlike any other of its kind, this gadget is designed with a base that pivots to provide optimum stability on surfaces that are uneven. Thanks to its unique construction and compact design, it is ideal for use during traveling and easy to store. Great for camping and hiking, this fan simply requires 6 D batteries to run at optimal standards. Featuring the latest in Smart Power technology, the O2COOl 10” Battery Operated Fan comes designed with the ability to automatically choose the most energy efficient power option at the time. Designed with multiple power source options, it can be backed up by plugin into AC or DC adapters which are included with the gadget, D-cell batteries, or its inbuilt rechargeable batteries. Crafted with dual speed settings, it comes equipped with a 10-inch blade and a USB port for those who would like to charge their mobile devices. For convenient carrying, it also includes a flip-up handle. The Coleman CPX 6 Lighted Tent Fan is a high-quality outdoor gadget that is compatible with all kinds of camping tents. Powered by multiple sources including a battery cartridge, a rechargeable cartridge, and an AC adaptor cartridge, it comes equipped with an inbuilt stand that allows the fan to stand up freely. Featuring a carabineer clip or magnetic plate, it can be attached to the tent with ease. Made with premium quality, durable materials, it comes designed with 4 5mm LED lights that produce up to 99 lumens. It also has 2 light modes including white light and night light; and comes with 2 fan speeds, high and low. Measuring just 5 inches in size, the O2COOL Battery Operated Clip Fan comes equipped with 2-speed settings and a handy clip design that allows users to utilize the fan on the go. Uniquely designed with a head that rotates, it allows users to direct the airflow wherever they need. 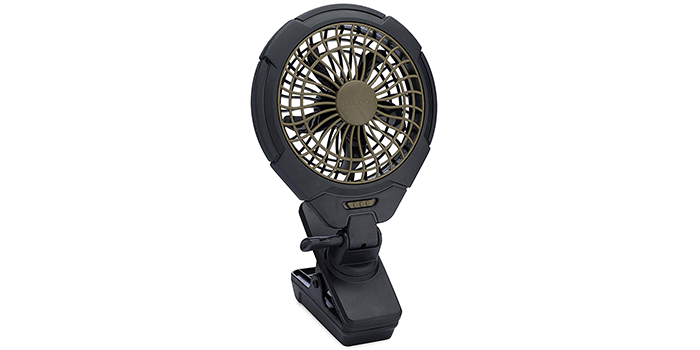 Convenient to use, durable, portable and light in weight, this fan can deliver up to 14 hours of runtime on the low-speed setting and up to 11 hours of runtime on the high-speed setting. Ideal for home and office use, this gadget can also be utilized for all kinds of outdoor activities including camping, hiking and more. Including 18 LED lens, the IMAGE Portable LED Camping Lantern with Ceiling Fan provides optimum brightness outdoors, while camping, hiking or at night during emergencies. 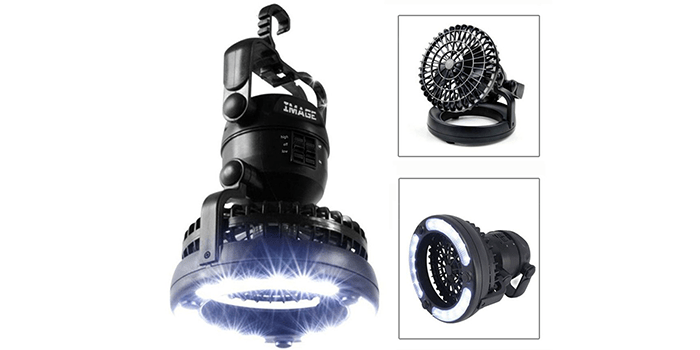 Equipped with an adjustable fan speed including a low and high mode, it comes with a 360-degree lighting angle that allows users to direct the light in any which way they desire. Equipped with a hook on the top of the device, it allows you to easily hang the device or hook it onto a tree branch or tent. Great for camping or other outdoor activities, this portable device is convenient, easy to use, and extremely durable.